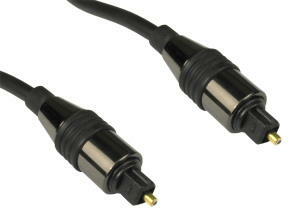 1m Toslink digital optical cable for making a fibre optic digital audio connection. A toslink cable is capable of carrying multichannel surround sound from set top boxes, TVs, games consoles, blu ray DVD etc to soundbars and surround sound systems. The toslink connector is approx 6mm square with 2 corners chamferred and round centre pin that carries the optic fibre.